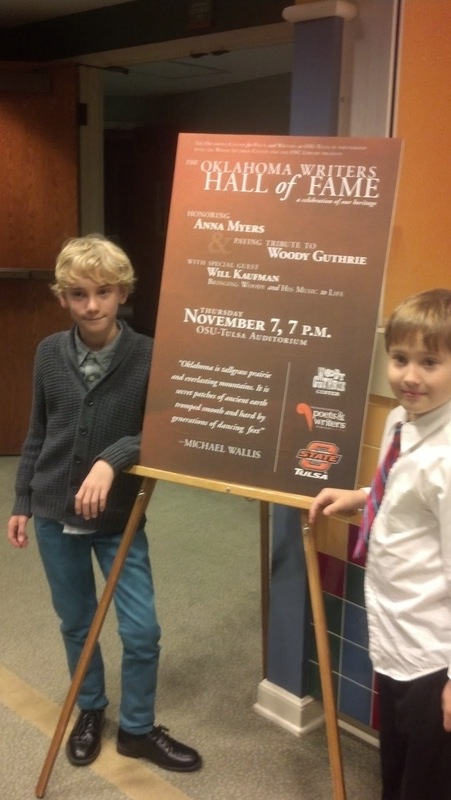 Paul and his younger cousin Will at the Oklahoma Writers Hall of Fame induction ceremony. The next lesson involves not sharing too soon. Soon after Paul began his book, a graphic novel (a manuscript with pictures) called Diarrhea, he began carrying about a big pile of papers, not stacked evenly. “Don’t look at this, Nana,” he said when he left his masterpiece near me. “It’s not ready for anyone to see it yet.” I told him I had seen all the diarrhea I cared to see, but I also realized the validity of his reluctance. A writer should not share his or her story until it is truly polished. I must confess, though, that I did peek at Paul’s project, just the last sheet. I was pleased to see the label “Eplog” at the top of the page. Writing is not Paul's only interest. Paul has also taught me about the financial side of the business. After he announced his intention to become a writer, he informed his mother that he was not going to be the same kind of writer Nana is. Thinking he might mention the graphic part of his work, Ginny asked what kind he planned to be. “The rich kind,” he said. 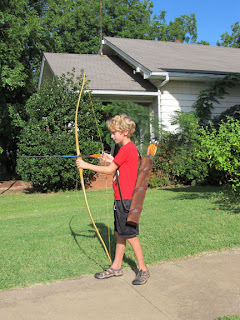 I like the way the boy thinks, and I’ve observed that he is on the right track. When we moved into our present home, four-year-old Paul immediately dubbed my writing room “the pencil shop.” Because it is connected to the living room by glass doors, the pencil shop has been a favorite play spot for all seven of my grandchildren. About a year ago, Paul put a sign on my office door that read, “Paul’s Book Company.” This time it was his smaller cousin, Elizabeth, whom he took into the business. They spent most of one day making picture books. Elizabeth not old enough to write, did only pictures. She also acted as salesperson, selling the books done by both of them to me for pennies, nickels, and occasionally dimes. Paul took all the money for his work and half of what Elizabeth earned. At first, I thought I should protest on her behalf, but I didn’t. After all, it was his establishment. My publisher certainly never gave me half of the profit. Maybe the boy really is going to be the rich kind. I wish I had known the last lesson I learned from Paul a long, long time ago. I decided at six to become a writer, but I did nothing about it for years and years. I believe Paul might well achieve his first publication long before I did because he has already learned what I didn’t know until I was in my forties. When some creators of children’s books came to Oklahoma to help raise funds for tornado victims, two of Paul’s heroes, Dav Pilkey, Captain Underpants, and Jeff Kinney, Diary of a Wimpy Kid, were among them. It’s been a few years since Paul read the Captain underpants books. Many of those stories he had read aloud on the school bus to other students, but Paul still has the books. He got them all out and sort of caressed them before going to hear the men speak. After the presentation, Paul had books autographed and got to talk to the writers. Dav Pilkey told him that he believed Diarrhea could be a best seller. He went home that Friday night and worked on his project until 2:30 a.m. He learned at ten that the interaction with other writers is vital for getting those creative juices flowing. Things might have been a lot different for me had I known earlier. Grace does not plan to be a writer. However, she wrote her first book at six. She stopped halfway through the story to say, "Nana, I got most of this from a movie." I assured her we could call the piece a "retelling." I can assure you that had Grace's story fallen into the hands of a certain Oklahoma publisher along with nearly 5,000. dollars, we would have been told the book was the first step in a very successful career. Elizabeth who often claims to be a kitty, but that is a different post. GRATITUDE: A crone feels gratitude. I’ve always been quick to list my many blessings. However, for some reason lately I’ve begun to feel intense gratitude. Really feeling the gratitude has made a huge difference in my outlook. Sometimes while I am out on my walk, I lift my arms and say, “Eternal Spirit, Mother, Father, God, Thank you.” Then I call out those things that fill my soul with thanksgiving. I mostly do this when there is no one about to hear, but if I am overheard, it won’t matter. It is hard to embarrass a crone. When I was a little girl, Rosemary Clooney, aunt of George Clooney, sang a song of invitation about her house. Evidently she felt about her home the same way I feel about mine. I’ve never loved a dwelling as much as I love the one on 9th Street. We bought the property in the fall of 2006 and moved in on our 5th wedding anniversary, September 21, 2013, J. C. having spent every weekend for a year working on improvements. Shortly after the move, he took on a job that kept him in Kansas most of the time for a few months, so I spent quality time alone with the new digs. On one of his visits back, he brought me a gift, a big stone with the words “Heron House,” carved into it. I adore the heron weathervane that sits atop my special room, but I thought naming the house seemed a little pretentious, considering the place’s many scars. The stone stayed, though, and the name has stuck, especially among my writer friends. One thing I did during my first days was to give a dinner party for several good friends from college along with some of their spouses. Most came from Oklahoma towns, a couple from Texas, but none of them had seen where I now lived. Almost every one of the woman said some form of “This house is so you,” upon stepping through the front door. They were, of course, exactly right! The people who built the dwelling, nearly two decades before my birth, most certainly would have denied the truth of my belief that this house has been waiting for me, always, but I know what I know. Oh, sure, others have lived here, and people will be here after I am gone. Maybe the house was built for them too. I hope so. I want only people who love these walls to own them. It wasn’t love at first sight, not on my part, at least. I do like to think the house had its proverbial cap set for me. I am grateful J.C, who has more of an artist’s eye than I, saw what I couldn’t, how stripping layers of paper from the walls, pulling down the ceiling –to- floor drapes , getting rid of the carpet that covered righteous, old oak floors would change everything. Very soon, I began to fall in love, and I knew at once the colors I wanted for the walls. I knew, too, that the side porch, once-screened now glassed, should be my writing room. From my desk, I can see the picturesque church we attend, observe comings and goings at the post office, and look out at the world from three directions. Don’t misunderstand, I loved the old farm house where my children grew up, loved it so much, in fact, that I am now unable to drive down that road again. I could never be happier than I was in that house, and also understand I’ve always enjoyed having company. Something, though, about my present home reaches into my soul, and that something also demands people. A couple of years ago, I had a bigger version of that 2007 college gathering. That second time, forty-five senior citizens broke bread together. Even more came to our house for the high school reunion, celebrating 50 years since J.C. and I graduated together a few blocks from here. There are Christmas parties for the Oklahoma Chapter of the Society of Children’s Book Writers and Illustrators, a few chili suppers for our church, book-launch parties, and lots of other get-togethers. During the first week of October, Oklahoma SCBWI put on a conference for 100 people in Chandler. On the night before, around twenty speakers, staff, and key volunteers gathered for dinner at Herron House. Six of those guests spent the night upstairs. On the last Sunday in October, the house hosted a birthday party for writer Patti Bennett’s 85th birthday. In between, there have been lunches for friends, family gatherings, and at least three overnight visitors. All seven of my grandchildren, ages 3-10, love to play upstairs, where they recently created a spook house, bringing up an important question. Is Heron House haunted? No, not in the way my grandchildren were trying to replicate. Are there spirits here? Definitely! I especially feel them in the dining room, and they are not necessarily former residents. When I sit with my writer friends discussing our projects, I sense a connection with others who have loved words before us, others who have thrived on the company of like minds. Using the bowl that belonged first to my grandmother and then to my mother to serve food to my family, I feel the strength in the hands and in the souls of those two women. Sharing a meal with precious friends from other days, I am aware that some bonds last longer than breath lasts in bodies. I never noticed such witnesses before moving here. Old houses, like old people, know things, and neither wants to be lonely. I am grateful to the people who built this house, the husband who saw its possibilities and who worked so hard on it, and, of course, to God for the chance to be part of its history. Undoubtedly, something of me will always be on 9th Street. On November 7th, I was inducted into the Oklahoma Writers’ Hall of Fame. It was a fantastic evening. Woody Guthrie was also honored that night, pretty neat to share a program with such a legendary figure. If you don’t know much about Woody Guthrie, a man who wrote 3,000 songs and fought fearlessly for the downtrodden, you should go to the Woody Guthrie Center in Tulsa. Nora Guthrie was there to accept her father’s honor. It was a joy to meet her and to hear Will Kaufman, who is a Guthrie scholar and who performs Woody’s songs between telling the audience about the amazing Oklahoman. Another pleasure was listening to renowned author Michael Wallis, known as Oklahoma’s ambassador to the world, speak about Woody and about a Tulsa landmark, Steve’s Sundry, Books and Magazines, about to close. My son, Dr. Benjamin Myers, introduced me and gave me the pin, making me an official member of the hall of fame. Ben’s introduction was much more eloquent and moving than my speech, but I don’t have a copy of that. For lack of having something better, I am sharing my words of acceptance below. Thank you, Ben. As a mother, I have to tell the group that Ben got in this afternoon from Wheaton College near Chicago. They flew him there to speak to faculty and students about his poetry, mostly those poems in his second book, Lapse Americana. And thank you to the Center for Poets and Writers for this wonderful honor. I hope all of you in the audience know how lucky Oklahoma is to have Teresa Miller and her organization, creating a culture for book lovers that is not common in other states. My sister, who lives in Memphis and who is also a writer, says Tennessee has nothing to compare with our center. I write for children, so, of course, I am going to talk about children’s literature. If you don’t like children or if you never were a child, you might want to take a restroom break now. Perhaps I should also explain now that, as a category, children’s books include those written for teenagers, as are many of mine. First, I’d like to clear up two common misconceptions about children’s literature. Right after my first book, Red-Dirt Jessie, came out, more than twenty years ago, someone said to me, “I don’t know much about writing, but I might know enough to write for children.” WRONG, WRONG, WRONG. It is harder to write for children. Have you seen how quickly a kid will close a book and pick up a video game? Story is one of the two most powerful forces in the world, second only to love. We write for children because children understand the power and magic of story, know it better than anyone. When my youngest child was small, she became very attached to her Bert doll. Her affection may have begun partly because the doll was given to her by her adored older cousin and partly because she recognized Bert from Sesame Street. Very quickly, though, Bert himself became an authentic person to her. He could not be put in an uncomfortable position, could never be left home alone. Bert had to be treated like a real person. Children understand the power and magic of story. I knew Lincoln had to die, but I kept hoping for a way out! Such, my friends, is the power of story. Children know the power of story! And it has been my privilege to share that power with older kids through nineteen novels, and I will share it with little ones for the first time next fall when my picture book, Tumbleweed Baby, is published by Abrams Books. I was born in west Texas, and my oldest brother told me always that he pulled me from a tumbleweed. My family left west Texas when I was six months old. Growing up in central Oklahoma, I had no idea what a tumbleweed looked like, but that same brother, fifteen years older than I, had a record called “Tumbling Tumbleweed.” I would sit outside his bedroom door and listen to that song. I suppose I knew I had not really been found in a tumbleweed, but I was a child who lived under story’s power. As I listened I would think, “Those are my people.” There are two or three true things about me in Tumbleweed Baby , so I lightly refer to the story as my autobiography. I am grateful to the family that pulled me from that tumbleweed and taught me about love. I am grateful too that I learned early about the power of story. The writer of the Biblical book of Joel was not talking about the power of story when he penned these words, but he could have been. The Center for Poets and Writers is all about the power of story, and we who write for children are all about telling the children. I borrowed this title from a very old movie, based on the book, Mama’s Bank Account. Today is the anniversary of my mother’s birth. I should always list her first when I list my blessings. Both my mother and my mother-in-law were women with extraordinarily strong personalities. I plan to write about my mother-in-law, Rose Myers, soon, but I am not sure I will ever write about Mama. How could I ever hope to contain her with words? I know my siblings feel the same way. However, they have always helped me, so they didn’t refuse my request to write about our mother on her birthday. They even abided by the word limit I gave them. Their names are above their memories. Nobody could have asked for a better Mama. Loving. Strong. Smart. Determined. Words that describe her before and after she gave birth to me when she was a few weeks shy of 42. I was by far the youngest of eight. Mama, nobody ever called her mother or mom, was a true Oklahoma woman. She started with nothing and finished with little more. She gave all she had to us. On the 106th anniversary of your birth, we honor you, Mama. We thank you from the bottom of our hearts. Why did you never believe it was safe for me to go near any water even after I became a certified water safety instructor? Weren’t you really half Jewish and half Italian? Why else would you have been cooking more than I could possibly eat and being so worried when I showed interest in a girl? Where did you get that amazing radar for which the military would have paid millions? It could sniff out beer or perfume at a million miles! It could even tell I “had something going” with a woman you saw only when the two of us were on a television talk show. Why did you drive my car to Oklahoma City and back to Chandler with the emergency brake on? I had to try to fix the brakes on the day man landed on the moon. Why did you refuse to let me learn guitar when I was a teenager because it “would lead to bad things,” only to buy a guitar and try to teach yourself to play it when I was grown? I think I know. It’s because you cared so much. It’s the same reason you borrowed $400 dollars from a high-interest loan company so I could pay for college the second semester. The same reason you told me to use your charge account at Hellman’s Department Store when clothes were needed for a special occasion. Mama’s decisions were not always welcomed and not always right. But there is no question they were made based on the same love and strength that made her such a remarkable Oklahoma woman. They were shared by our loving Father, Ross. They are the values that flow through all of their descendants. The dictionary defines the word as a female human parent. Three short words to describe the woman who, if not the most important person in one's life, is certainly right up there near the top. The dictionary doesn't begin to tell what that word means. My Mama could never have been Mother, Mom, or any of the other titles some use to identify that female human parent. She was simply Mama to her seven children and two of her grandchildren. Even her husband (Daddy) called her Mama. She was born Cecil Eaton on November 8, 1907, in Indian Territory, only days before Oklahoma became a state. Today is the one hundred sixth anniversary of her birth. My sister, The Crone, chose this date and method to "remember Mama." I have very few family memories before about sixth grade. One of them is when we were living in Cashion and Mama had some or all of her teeth extracted. I remember being up late with her and applying hot cloths to her jaws, which I now know was the wrong treatment. My next clear memory of Mama is when she and my infant brother came home from the hospital. Perhaps both those events stand out in memory because I knew she was in pain. In later years, the alleviation of Mama's pain was of major importance in the lives of her family. There were hard years at the end of her life, for her and everyone who loved her. The years between the beginning and the end were memorable, filled with laughter, tears, and much love. Mama could laugh like no one I've ever known. She gave it her all. She could worry and cry with the same vehemence. When we heard Mama scream in the kitchen, we didn't know whether she was injured or thought she had salted the gravy twice. We depended on her and she also depended on us. A typical remark was "kids, I've lost my purse," which would set us all to finding it. All her adult life, Mama loved her "kids" above all else. She managed to always have available what we most needed. There was good food, warmth, clean clothes, and an abundance of love. Mama was a true blessing to all of us. If our own descendants can say the same for us then we will have succeeded in paying her the tribute she deserves. I love you Mama; see you later. Texas morning, 4-12-42: Our dear Anna’s birth at home: Mama allowed me (almost six) on her bed near her to eat lunch Daddy’d prepared. 1943, Dolly with closing eyes under Christmas tree. Annual yellow Easter/birthday dresses. Rationed brown oxfords/pink anklets from Mrs. Reeves’ Stonewall store… 1946 church Christmas program - yellow sweater Mama let me unwrap early. Cream-of-wheat, Cashion’s frosty mornings. Fried chicken, okry, roast’nears, flaky-crusted pies! White eighth-grade-graduation dress. Deer Creek HS schoolbus delivers ravenous me home to waiting beef/gravy over mashed potatoes. Surprise clock-radio (pink) left at my dorm room. Navy suit for first teaching job interview. Tan maternity outfit mailed to Florida for first pregnancy. Mama's merciful train journey to St. Louis after my second childbirth. Pink layette/baby shoes sent to Memphis, welcoming our youngest. Granddaughters’ birthday cards, dollars enclosed. Affectionate relationship with my Charlie, recipient of her Collector’s Avon bottles. A paraplegic her last decade, Mama lived at home. Daddy helped her until his death, their children always, and professional caregivers. She rejected invalid. Forever industrious, she’d devotedly tended house and family. So two sons made Mama’s kitchen wheelchair-accessible; she traveled to Memphis weddings, twice more for extended stays. Charles observed that Mama, resources limited, somehow spoiled us all, including ten grandkids. She’d have delighted in #11, her beloved baby’s son (Daddy’s namesake); would've cherished the latest great-grandchild, Her own namesake. A representative memory, 1989: Wearing a housecoat, Mama on her motorized cart models a Dutch cap she’d requested from our Holland trip. Indomitable.